WiggleDoodle: Flickr Gave Me 1TB Space for My Photos for Free! Flickr Gave Me 1TB Space for My Photos for Free! I just noticed this afternoon that my Flickr account looked different. The photos that used to be arranged neatly in columns are now filling the pages. No more empty white spaces, just photos in different sizes. Then I opened my mail and discovered that Flickr has just introduced innovation to my favorite online photo sharing site. 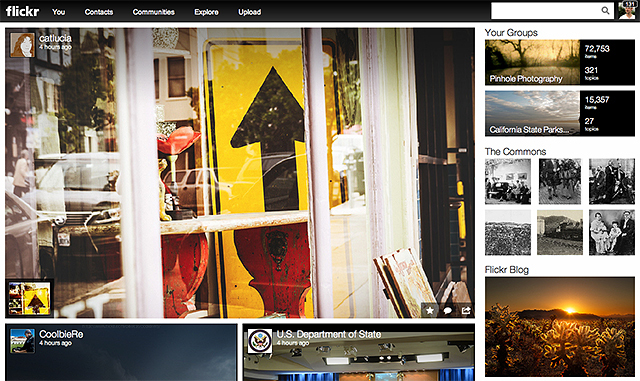 Flickr has a new design that puts photos at the heart of its users' Flickr experience. The homepage is now a gateway for everything the site has to offer. A new Activity Feed combines recent uploads with activity of photos of the users and their friends. There is also a slideshow mode to allow users to flip through photos hands-free. At Flickr, we believe you should share all your images in full resolution, so life’s moments can be relived in their original quality. No limited pixels, no cramped formats, no memories that fall flat. We’re giving your photos room to breathe, and you the space to upload a dizzying number of photos and videos, for free. Just how big is a terabyte? Well, you could take a photo every hour for forty years without filling one. And yep, you heard us. It’s free. Aside from more spaces for photographs, Flickr is now supporting up to a full 3 minutes per video of 1080p HD quality. And there's another major change, a little kink for me. Flickr Pro is not being offered anymore and in its place, the site introduced the Ad-Free and the Doublr accounts which basically have the same benefits as the free account except that subscribers can browse ad-free. Doublr account holders also have up to 2 terabytes of space for their photos. Ads-free accounts come at US$49.99 per year while the Doublr is offered at US$499.99 annually. By the way, if you have a pro account you can still renew it at US$24.99 per year and still have an ads-free and unlimited browsing experience. However, the "pro" badge in your profile and buddy icon will not be there anymore. Anyway, that's 1 terabyte of free space plus ALL your photos and videos are available for your visitors to see and watch. Not bad for a free account. I just hope it stays that way.